Pinocchio's nostalgia will make any fan relive the moment when they first saw the movie and it gives parents the opportunity to share the experience with their kids. In 1940, Walt Disney captured our imaginations when he brought the beloved character of Pinocchio to the theaters. Based on the Italian children's novel by Carlo Collido it teaches valuable lessons about lying and the differences between right and wrong. With lovable characters and catchy songs, it melted hearts all over the world and has continued to be a classic Disney film. While there have been numerous releases of this movie, Disney has decided to make it part of their signature collection and re-release it on Blu-ray and, for the first time, on digital download. This exciting release allows families to share this story with the next generation and introduce a whole new audience to Pinocchio, Geppetto and Jiminy cricket. Geppetto was a lonely woodworker whose talent had him making clocks and marionettes but he only wished for one thing of his own. He wished to have a son of his own. When a fairy grants him his wish and makes the puppet Pinocchio come to life, Geppetto is overjoyed. All Pinocchio has to do is be a good boy and he can remain "real". Unfortunately, Pinocchio has a hard time remaining good even with the help of his conscience, Jiminy Cricket. He ends up in a series of scenarios that force him to be bad and not listen to his conscience. Of course, in the end, he learns his lesson and he gets to live happily ever after as a real boy with is father Geppetto. Pinocchio includes the voice talents of Mel Blanc (Bugs Bunny), Cliff Edwards (Dumbo), Dickie Jones (Buffalo Bill, Jr.), and Christian Rub (You Can't Take It With You) and obviously the drawing talents of the animators of Disney. For 1940s animation, the artwork is very good. The Signature Collection Blu-ray is presented in 1080p high definition video with a 1.35:1 aspect ratio and offers a DTS-HD Master Audio 7.1. The remastering of the video allowed animators to fill in the colors beautifully. The hues are vibrant and everything pops off the screen. The audio can be a bit garbled at times but one can only expect so much from a 1940 film. Of course the classic songs, including When You Wish Upon A Star, are still a treat and monumental moments in the film. 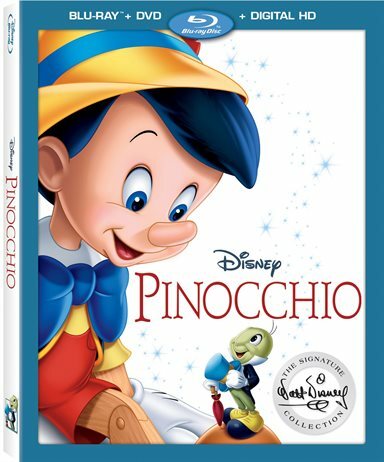 The Blu-ray has several previously released extras including deleted scenes, the making of Pinocchio and Storyboard to film final comparison. This version also offers a few unique extras. These include The Pinocchio Project where new, young talent record their own version of When You Wish Upon A Star, Walt's story Meeting: Pleasure Island describing how they came to the final scene for Pleasure Island, In Walt's Words: Pinocchio that offers archival footage of Disney discussion Pinocchio, and Oswald the Lucky Rabbit in Poor Papa – an animated short. It's amazing that a film that is almost 80 years old can still be relevant and enjoyable to today's audience. It's also wonderful that everyone can purchase this classic and not only relive their childhood but also screen it for a new generation of Disney and Pinocchio fans. If you already own a fully stocked library of Disney Classic movies, you will definitely want to add this one to your collection. Pinocchio's nostalgia will make any fan relive the moment when they first saw the movie and it gives parents the opportunity to share the experience with their kids. Definitely, a must own Blu-ray. Download Pinocchio from the iTunes Store in Digial HD. For more information about Pinocchio visit the FlickDirect Movie Database.